Using Weinig equipment, our moulding department offers the ability to produce high quality and competitively priced mouldings. Using AutoCad and CNC technology we are capable of making any moulding you desire and have the ability to match an existing moulding exactly. Our AutoCad Design and our CNC departments work together to produce amazing and beautiful products. Utilizing this technology we can produce intricate carvings, complex radius work, breathtaking entry units, and just about anything else you can imagine for your home. We take pride in employing the finest craftsmen in the industry. It is through their skills and vast experience that we are able to produce the finest millwork available. 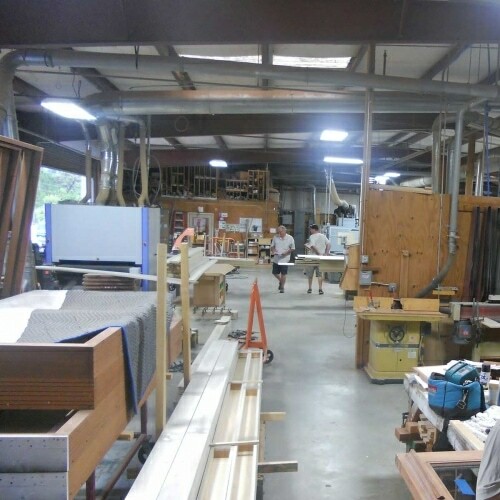 Among our craftsmen are those that specialize in various aspects of millwork products, such as carvings, turnings, entry units, radius work, and cabinets. Since 1995, All Phase Custom Mill Shop has been supplying its customers with architectural millwork of the highest quality. Our reputation for creativity, craftsmanship, and customer satisfaction has earned us a position as one of Southwest Florida’s premiere millwork suppliers. Whether your need is large or small, All Phase Custom Mill Shop appreciates the unique and creative addition that custom woodwork provides. Our highly skilled and experienced craftsmen endeavor to create the wood elements — mouldings, custom built-ins, cabinets, doors, and more — that will transform your spaces into warm and rich surroundings. Our 15,000 square foot manufacturing facility features state of the art equipment. The latest Weinig and Homag machinery allows our artisans to produce the finest quality work while maintaining a high level of efficiency. At All Phase Custom Mill Shop, we understand the importance of timely production and continually expanding to meet our customers’ needs while maintaining the high level of quality that our reputation has been built upon. Our goal is to provide our customers with beautifully crafted wood products at competitive prices. We will build you what you want. Period. No surprises or disappointments. If you can dream it, we can build it. We maintain control throughout the design and construction process to ensure that your products are built to the highest quality standards. All Phase Custom Mill Shop, Inc.